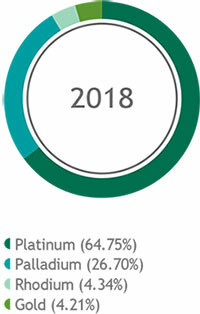 Platinum group metals (PGMs) are found as a compound which includes six pure metals with high melting points: platinum (Pt), palladium (Pd), rhodium (Rh), iridium (Ir), osmium (Os) and ruthenium (Ru); as well as gold and base metals such as nickel, copper and cobalt. In addition to their oxidation and reduction properties, these metals have the ability to stay stable at high temperatures and are extremely resistant to corrosion. Platinum is an excellent raw material and catalyst for manufacturing processes due to its distinctive chemical and physical properties. Platinum and other PGMs are used in a number of industrial processes and commercial applications – in flat panel monitors, glass fibre, medical tools, computer hard drives, nylon and razors, among others. The largest users of PGMs (Pt, Pd and Rh) are automotive catalytic converter applications that reduce pollution by treating exhaust gas before it leaves a car. 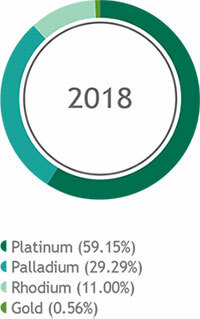 Platinum is an essential precious metal and retains its status in the prestigious jewellery market, which accounts for approximately 20% of the world’s platinum production. Some 80% of this production comes from the 550-square-kilometre Bushveld Complex in South Africa. Although PGMs share similar chemical properties, palladium has the lowest melting point and is the least dense of these precious metals. Palladium is used in the manufacture of various electronics including computers, mobile phones, multi-layer ceramic capacitors, component plating, low voltage electrical contacts, and televisions. Palladium is also used in dentistry, medicine, hydrogen purification, chemical applications and groundwater treatment. Palladium plays a key role in the technology used for fuel cells, which combines hydrogen and oxygen to produce electricity, heat and water. The numerous applications and limited supply sources of palladium result in palladium drawing considerable investment interest. The most extensive palladium deposits have been found in the norite belt of the Bushveld Igneous Complex in South Africa and in nickel sulphide deposits in Russia. Rhodium is a chemical element that is a rare, silvery-white, hard and chemically inert transition metal. It is mostly used as a catalyst in the three-way catalytic converter. Rhodium is a rare metal and is inert against corrosion and most aggressive chemicals. It is therefore usually alloyed with platinum or palladium and applied in high-temperature and corrosion-resistive coatings. White gold is often plated with a thin rhodium layer to improve the optical impression, while rhodium detectors are used in nuclear reactors to measure the neutron flux level. Ruthenium is a rare transition metal and like other platinum group metals, is chemically inert to most other chemicals. Although ruthenium is found associated with platinum ores, it is a minor component in these ores and therefore a relatively rare metal. Most ruthenium is used for wear-resistant electrical contacts and the production of thick-film resistors. Another, minor application of ruthenium is its use as an alloying agent to harden platinum and palladium. Silver-gray ruthenium metal looks like platinum but is rarer, harder, and more brittle. A very hard, brittle, silvery-white transition metal of the platinum family, iridium is the second densest element (after osmium) and is the most corrosion-resistant metal, even at temperatures as high as 2000°C. Although only certain molten salts and halogens are corrosive to solid iridium, finely divided iridium dust is much more reactive and can even be flammable. The most important iridium compounds in use are the salts and acids it forms with chlorine, though iridium also forms a number of organometallic compounds used in catalysis and in research. Osmium is a hard, brittle, blue-gray or blue-black transition metal found in nature as an alloy, mostly in platinum ores. It is the densest natural element - twice as dense as lead. The density of osmium is 22.61g/cm³, slightly greater than that of iridium, the second densest element. Osmium is used in alloys, with platinum, iridium and other platinum group metals for fountain pen tips, electrical contacts and other applications where extreme durability and hardness are required. Gold is the most malleable and ductile pure metal known. Pure gold has a bright yellow colour and lustre traditionally considered attractive, which it maintains without oxidising in air or water. Gold is one of the coinage metals and has served as a symbol of wealth and a store of value throughout history. Gold, however, has many modern industrial uses including dentistry and electronics. It is often used due to its good resistance to oxidative corrosion and as an excellent conductor of electricity. Gold is the most useful metal in the jewellery industry in the manufacture of rings, bracelets, necklaces, earrings, among others. As gold lacks resistance to pressure and is highly malleable, all gold jewellery is alloyed with other metals to increase its toughness and durability. Silver is a soft, white, lustrous transition metal. It possesses the highest electrical conductivity of any element and the highest thermal conductivity and reflectivity of any metal. It is very ductile, malleable and slightly harder than gold. The metal occurs naturally in its pure, free form (native silver), as an alloy with gold and other metals. While silver has long been valued as a precious metal it is also used in currency coins, solar panels, water filtration, jewellery and ornaments, high-value tableware and utensils (silverware) and as an investment in the form of coins and bullion. Silver is used industrially in electrical contacts and conductors, in specialised mirrors, window coatings and in catalysis of chemical reactions. It is a steely-grey, lustrous, hard and brittle metal which takes a high polish, resists tarnishing, and has a high melting point. Chromium metal and ferrochromium alloys are commercially produced from chromite. Adding metallic chromium to steel makes it highly resistant to corrosion and discoloration and results in stainless steel. This application, along with chrome plating, currently comprises 85% of the commercial use for the element.